Poor Anupam Kher cannot catch a break. 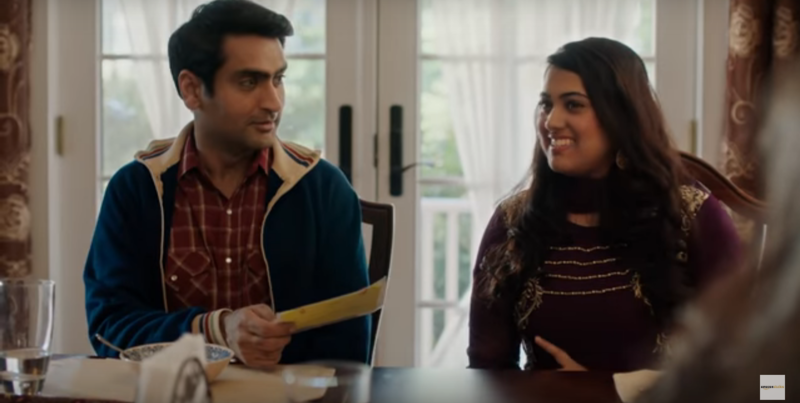 From his role as an orthodox Sikh parent to Jeswinder “Jess” Kaur Bhamra in “Bend It Like Beckham” to Pakistani immigrant father to Kumail Nanjiani’s character in “The Big Sick,” his on-screen children sure love white people. All jokes aside, “The Big Sick” is an important film. It is art that has generated insurmountable conversation and even controversy, which means it has done its job. What good is an identity-based narrative if it does not generate dialogue about its purpose, intention, and meaning for audiences? Much like last year’s “Get Out,” this film has inspired numerous thinkpieces and analyses about race, identity, love, and relationships for people of color in the U.S.
Aditi Natasha Kini wrote a stellar piece for Jezebel on her exhaustion of brown men falling in love with white women on screen. Tanzila’s Ahmed’s piece that touches on her desire to imagine love without the necessity of whiteness and white identities is spot on. Nadya Agrawal presents a compelling analysis in Quartz India around similar issues. Amil Niazi is out here too. Question: why do we all feel obligated to put disclaimers on our writing and proclaim our appreciation and love for this movie before criticizing it? Even I did it. Weird. If you’re here for a full review, I’m afraid you’re in the wrong place. I’m not here to talk about how touching it was, its gentle pacing, or the amazing performances by each of the actors. Are all of these things true? Yes. Kumail Nanjiani and Judd Apatow have done something special – they have generated art that encapsulates and articulates love that is real in its awkwardness, joy, and pain. However, it is particularly in its portrayal of Pakistani women where we run into some issues. Of course, this is Nanjiani’s world and it’s based on his real-life relationship with his wife Emily Gordon. But as an audience, we were given just a handful of moments with Pakistani women on screen. Though we were given just a few precious moments into the notions of Pakistani womanhood in the U.S., the opportunity for further analysis and criticism is too exceptional to pass up. And in these moments, the artistic and rhetorical decisions that are made leave many of us wanting more than the typical one-dimensional, stereotypical, and in some ways, even dehumanizing portrayal. Taylor Davis, in her analysis of “Get Out” argued that the “lack of black women in Get Out means more than you think.” Here, I’m borrowing the foundation of Davis’s analysis and observations and arguing that the lack (or limitations) of Pakistani women in “The Big Sick” speaks volumes. Here come the spoilers now. Two moments stood out to me in this film that left me wanting more depth, dimension, and perhaps even a full feature-length film detour into the experiences and identities of Pakistani women in the U.S. The first moment is when Kumail drops (what was her name??? With the beautiful curls??) off at her house. She is the only “rishta” who appears twice in the film and upon being dropped off, she asks Kumail if he would be interested in meeting again. He politely rejects her, expresses that she deserves better, and the curly-haired queen gets a little emotional. There is a silence in Pakistani social and cultural hegemony, where young, marriageable women are expected to participate in the customs, norms, and social traditions of hegemonic desi marriages – and they are expected to do so in an incredibly formal, polite, and “seedi saadi” demeanor without displaying emotions or vulnerability. In “The Big Sick,” when the curly-haired-girl tears up and asks Kumail, “do you ever just want a relationship so you can just…relax?” is a loaded declaration and a confession that illuminates the complicated medley of pressure that characterizes the hegemonic approach to finding a life partner. Deep in the layers of this declaration are family pressures, unresolved feelings of desirability, the dissonance between the culture at home and the American one, and ethnosexualized stereotyping. The second moment that comes to mind relates to Kumail Nanjiani’s box of rishta pictures (eligible Pakistani bachelorettes arranged by his mother), which resides on a dresser in his apartment. When Gordon finds it, she flips out and the scenario escalates into a fight that effectively terminates their relationship. During an attempt to reconcile towards the end of the film, Nanjiani’s character arrives with a peculiar jar of ashes. He jokes that it is the ashes of the bachelorettes, and goes on to explain that he burned the pictures, placed them in a jar, and is offering this to her as one of three significant items that he described as an indication of his “devotion” to her. I was caught incredibly off guard by this scene and was amazed that it made it into the final cut, given the significance of fire and women in Pakistan. For those unfamiliar, there is a widespread issue in Pakistan where issues of domestic violence and violence against women in general, manifest through the use of weapons like fire and acid. The punishment for some women who choose to evade an arranged marriage and elope with a romantic partner? Being burnt to death. Rejecting a marriage proposal? Death by fire. The Aurat Foundation, a nonprofit in Pakistan that has been tracking these types of attacks on women for rebelling against hegemonic expectations, estimates that over three thousand women have been killed in these type of attacks since 2008. So for Kumail to set fire to these pictures, reduce them to ashes, and present them facetiously to his white ex-girlfriend in an attempt to win her back signifies a sort of death, disintegration, and rejection of brown womanhood that has an incredibly powerful and brutal connotation for Pakistanis and is indicative of women lacking agency. Unintentional or not, the symbolism of fire, ashes, and burning pictures is important here. Is this a good time to talk about Franz Fanon? Black Skin White Masks may have come out in 1968, but it’s still as real as ever. In a 2008 submission for Transformative Cultures eJournal, Jann Dark writes that “Franz Fanon has highlighted this as one of the dynamics of colonialism, where colonized people’s response to experiencing racism is one of a fantasy and desire to reclaim self-esteem through sexual relationship with the woman of the colonizer (Fanon, 1968:63). In this context, the woman takes on symbolic cultural value in the contest between colonized and colonizer.” Dark writes extensively about Elizabeth’s character and her unrequited love for Bhuvan in “Lagaan,” arguing that her placement and location in the hierarchical social structure of the film is between the East and the West, between traditionalism and modernity, between Indian nationalism and assimilation. In “The Big Sick” too, Gordon is the crux between the East and the West, a crux that is articulated most profoundly when Nanjiani tearfully bombs through a comedy routine and discloses his personal trauma and experiencing family disownment to an audience of unwitting attendees. Gordon even admits this position towards the end of the film, proclaiming to Nanjiani that she does not want to be the reason he loses his family. We can’t talk about brown people falling in love with white people without mentioning the transformative and pivotal research that has been done on Indian films and media. Intertwined in the politics of love and desirability are conversations on colonialism, hegemony, and colorism, three forces that still impact not only South Asian nations, but South Asian American social norms, graces, and spaces. In a community where skin lightening products can either be normalized or demonized depending on who you talk to (despite efforts by activists to make folks aware of the toxic components of these creams and inspire local government to better regulate them and hold manufacturers accountable), where the choice of negotiating identity politics to assimilate into Western society is a hot topic of debate, where the innocence of Muslim women and femininity is constantly in grave danger. It would be a mistake to have a conversation about love in a vacuum, because whether subconscious or not, the remnants of colonialism, the persistence of colorism, and the expectation of social and cultural hegemony has many of us millennial South Asian American practicing and non-practicing Muslims navigating a tricky terrain of familial expectations that often differ significantly from our lived experiences in a culture that is as unfamiliar to our parents as it is familiar for us. Am I happy that Kumail Nanjiani shared this touching film with the world? Yes, absolutely. This film is important given that it is 2017, but we need to keep moving. There is more intensity needed around the nuances of brown Muslim women’s narratives, identities, and the trials and tribulations we encounter in love, too. Is the stereotyping a big deal? It could be. Especially if we piece it together with the other media coming out from brown folks about brown folks and the media that has been coming out from white folks about brown folks for far too long. Between Aziz Ansari, Hasan Minhaj, and Kumail Nanjiani, it may be dangerous to become comfortable with the refrain that brown women are undesirable, uncool, and unworthy. And while some folks have criticized brown women writing thinkpieces on this film for a) for unfairly focusing on these three artists alone, b) putting too much pressure on Kumail to tell a story that isn’t his own, c) projecting our own identity issues and politics onto a film and “ruining” it for everyone and d) putting the cart before the horse and failing to recognize that we should be satisfied that representation is on its way, none of these counterarguments have convinced me to quiet down. Are all of these counterarguments true? It’s possible. However, I implore readers to read the articles from the perspectives of South Asian Muslim women with a little nuance, because we do have a lived experience in the exact same community that Kumail comes from, a perspective that is just as valid as his, and desires for representation that are likely to only be find their home on the silver screen if we illuminate these lived experiences and perspectives. There’s a reason that many of us brown women are huddling together in theater lobbies after seeing “The Big Sick” to vent, discuss, and analyze what we’ve just seen. Our community is complicated and so are our stories, and it’s about time Hollywood prompts us to do more than just scratch the surface of stories about our endeavors. This is prolly one of the best articles I’ve read here. A well written piece exposing Muslim hypocritical mentality. This was the actor’s real life story. He fell in love with a white woman and his family didnt accept. Maybe the question is why do you have a problem with him being in an interracial relationship? Hi Jillian! Thank you so much for your comment. In the piece, I acknowledged that this is Kumail’s life story and the intention is not to expect Kumail Nanjiani to speak on behalf of the entire community or take on a bigger representation than what he has already. Rather, I am trying to use this film as a jumping off point for a broader conversation on love, relationships, and the frameworks of desirability as informed by global and domestic concepts in white supremacy, colonialism, imperialism, and colorism. I think what is so fascinating about this fantastic film, which I enjoyed very much and appreciated, is how much it has opened up a space to speak broadly about love and choices in a radical framework that takes into account social, political, and economic ideas, theories, and conditions for people of color. Very good/detailed article, however, I have to add that NOT all actors, writers, producers, etc. in (mainstream/Hollywood) media are as knowledgeable about the topics you mentioned. They may NOT have studied much re: colonialism, watched indie or even Bollywood films from India, or even had a close brown/female/Muslim friend (and yes, this includes a LOT of Muslim men in US). I suggest we ladies start by telling our OWN stories, NOT worrying about what men have previously cast us as in the past. This is extremely true – thank you Nusrat! You’ve raised such an interesting point. Now that I think about it, I wonder if there is any sort of resource on radical knowledge (on colonialism, racism, sexism, homophobia, etc.) that artists can leverage for awareness and consciousness as they produce art and media. I firmly believe that there should be some sort of community/engagement between those who are aware of this type of knowledge/literature/concepts behind marginalized experiences + artists who are out there representing said marginalized experience. I’m so glad you made this comment. Great article! Do you have a link/more information to the Aurat Foundation’s research on attacks on women?